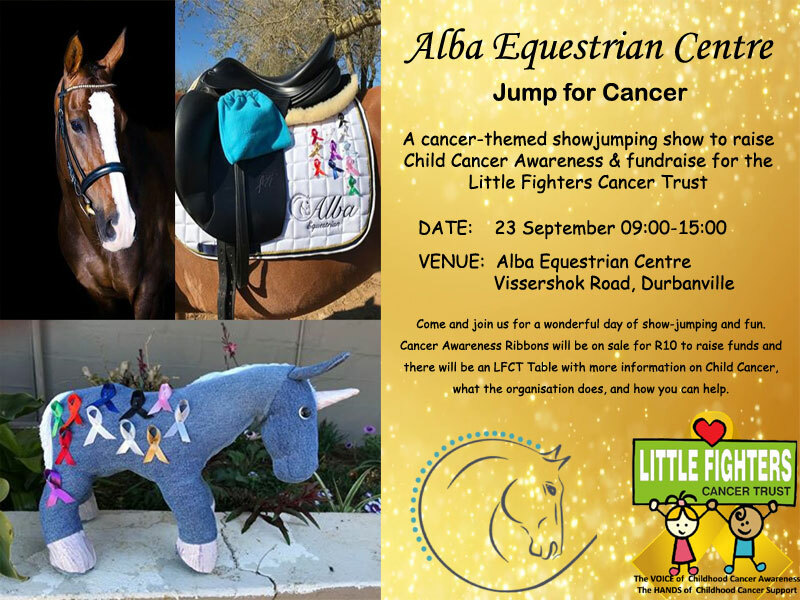 The Little Fighters Cancer Trust would like to extend a massive, heartfelt thanks to Alba Equestrian Centre for hosting the very first (to our knowledge) “Jump for Cancer” in South Africa (perhaps even the world) to raise Childhood Cancer Awareness as well as to raise much-needed funds for LFCT. We were contacted via our Facebook Page on 2 August by a lady named Carla du Plessis, whom we assumed was the owner, regarding a “Jump for Cancer” show-jumping show that they wanted to hold on 23 September in aid of LFCT, and of course we jumped at the opportunity. Carla came up with the great idea for family & friends to sponsor those taking part via purchasing Cancer Awareness Ribbons (for various cancers including child cancer) @ R10 each, and with various prizes up for grabs for most ribbons and most creative use of ribbons, they virtually FLEW!!! NOBODY thought that this would be SUCH a success – put it this way; sales of ribbons brought in R11 170 – 00 in other words, 1 170 ribbons were sold!!! That is A LOT of ribbon which had to be cut and folded and A LOT of tiny safety pins which had to be attached, and then all the ribbons had to be pinned and sorted once they were sold!!! Thank You SO MUCH to the farriers who sponsored all the ribbon and who challenged other farriers to do so – YOU GUYS ROCK!!!!! Thank You SO MUCH to those who spent hours and hours cutting, making, sorting and selling the ribbons – YOU ARE AWESOME!!! The most ribbons bought by a single person, by the way, was a staggering 210!! thanks for the support and congratulations Trish Knott. And how creative is THIS MASSIVE RIBBON made up of all small ribbons?? AWESOME!! Thanks for all the support and hard work!! Two professional photographers came on board and those who wanted photos could only get them by making a minimum R50 donation to LFCT. A renowned artist also came on board and offered a painting of the winner of the raffle’s horse (or other animal). Sunday 23rd eventually dawned and I literally dragggged myself out of bed really early (not a morning person and usually lay in until at least 9 on Sundays before getting behind the laptop for the day) and made my way to Alba Livery in Durbanville – and I was SO glad I did. It was only upon arrival at the venue that I actually met Carla (and everyone else who had been there since 6am already), and you could have blown me over with a feather when I realised that Carla is a 17-year-old Grade 11 scholar!!!! Carla – I take my hat off to you for the professional manner in which you organised this event and for the flawless way that the whole event went off. I would also like to say that apart from the event being such a success, the venue was lovely and so peaceful that I actually mentioned that even though I was working, it was the first time in more than a year that I was so at peace and that my mind was not buzzing with a million thoughts about what I needed to do…. BLISS!!!! There was however another Family team, and that was Carla’s family…. Carla organised the whole event and was very busy in the arena during the whole event on the day; Mom Liesl and aunt Deidre were busy selling raffle tickets and ribbons, and collecting cash donations for the photos as well as generally seeing that all went smoothly in other areas; Gran was keeping very busy in the Horseshoe Café kitchen with brother Stefan doing front of house with a friend, and they were run off their feet so much so that they sold out of virtually everything by the end of the day; Grandpa and Uncle were manning the braai making the wors for the boerewors rolls, and Dad Grant arrived straight from the airport (fresh from Barcelona) sometime during the morning and came directly to the event, cementing what was really a great “family affair” of note! We would also like to say a special thank you to Carla’s younger brother, Stefan who runs the Horseshoe Café, for lovingly donating 100% of his profits for the day to LFCT in honour of a young friend – Stefan YOU ROCK!!!! The Little Fighters Cancer Trust would hereby like to thank Alba Equestrian Centre and everyone else for their contribution to this fantastic event which resulted in a WHOPPING R25 000 donation!! In closing, once again, on behalf of all our Beneficiaries, THANK YOU to Carla; to the people who worked so hard on getting the arena just right and all the jumps arranged and set up; to Carla’s family for all the hard work you all put in; to those who sponsored various goodies; to those who took part, and to those who came to cheer! !